Sinn Fein members have removed tricolour flags that were placed on a Church of Ireland building in County Down. The flags were flown from scaffolding at the church building in Rostrevor. A Sinn Fein spokesperson said the party members were verbally abused while removing the flags. "An anti-community element erected tricolours above the scaffolding of Rostrevor’s Church of Ireland," the spokesperson said. "We have removed the flags. Our members were verbally abused by the person in question, his actions do not speak for the community of Rostrevor and never will." Sinn Féin MLA Sinéad Ennis has praised the actions of the local party activists. 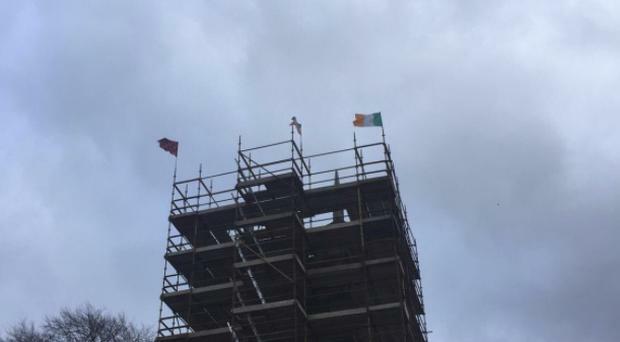 “A local man erected national flags yesterday on scaffolding at Rostrevor’s Church of Ireland," the South Down MLA said. “Local party activists quickly removed the flags despite being verbally abused by the man responsible for erecting them. “He clearly doesn’t know or doesn’t care that the Irish national flag is a symbol of peace between our two main traditions. “It is Sinn Féin’s position is that no flag or emblem should be erected to mark out territory, to harass, or intimidate anyone and it was clearly provocative to erect flags close to a place of worship. “There have been good relations between all the people who live in Rostrevor and its hinterland.